Who is “Wedgwood in Seattle History?” It’s me, Valarie. Wedgwood is the neighborhood in northeast Seattle where I (Valarie) grew up. My research and writing began when I was a PTA mom in the local-history project of Wedgwood Elementary School in 1991-1992. From that beginning which mostly involved interviewing elderly neighborhood residents, over the years I learned to use more research resources such as property records. 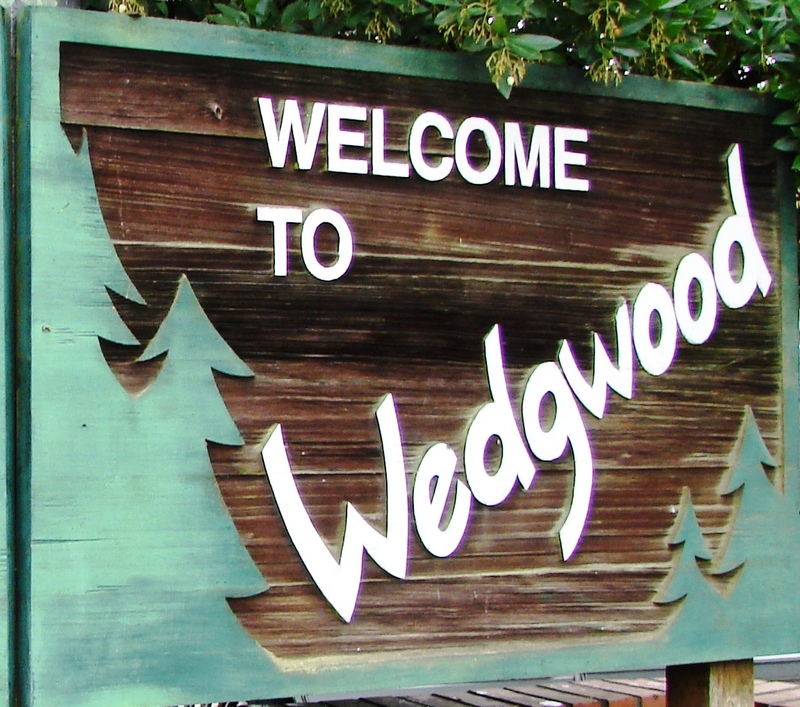 In 1995 the Wedgwood Community Council placed two Welcome to Wedgwood signs using Dept. of Neighborhoods grant funds. In 2007 the matching sign was stolen from the corner of NE 70th Street. A police report was filed, so if you know where the missing sign is, please report it. The purposes of the Wedgwood in Seattle History blog are to tell stories of the development of northeast Seattle neighborhoods and their setting in the time periods of Seattle history, and to highlight the research resources which everyone can access: many sources are now on-line. See “Links” on the right-side-margin of this blog page for the list of resources I regularly use. One of my goals in writing about neighborhood history is to go back as far as I can in available records. For that reason I have researched property records, the census, newspapers and many different archives, to tell stories of how people came to live in northeast Seattle. I learned that there were early homestead land claims in the Wedgwood area made by Civil War veterans who came from other states, to find available land Out West. In the 1870s several Civil War veterans had homestead claims in the Wedgwood area, including the land around Wedgwood Rock where homesteaders had a Fourth of July picnic in 1881. Wedgwood Rock is located at 7200 28th Ave NE in Seattle. Later in the 1880s and 1890s, plat names told the story of attempts to develop land in (the future) Wedgwood. Would-be developers bought land in northeast Seattle in those early years, especially around the year 1890, but the land was too far out of the city and lacked resources such as access to water. Examples of failed land ventures were Charles Baker‘s State Park and Oneida Gardens plats, and Joseph Doheny’s Pontiac. This and other stories of early land investors are told under the Plat Names category on this blog. Here is a quiz where you can test your knowledge of the history of the Wedgwood neighborhood. Many bloggers find that over time they want to diverge from their original purpose or add sidelines. This blog started out in January 2012 to be just about Wedgwood but then I found other stories of Seattle history which I wanted to include. I have added stories about other northeast Seattle neighborhoods, most especially Meadowbrook which is contiguous with Wedgwood on the north. In 1898 the Maple Leaf School was made up of children from two German immigrant families, the Fischers and Ohlands. Later the neighborhood name became Meadowbrook. This photo used by permission of the Blindheim family. I delved deeply into the history of Meadowbrook when I was commissioned to create a display book for the opening of the Meadowbrook Community Center in January 1997. I interviewed elderly neighborhood residents who were descended from Meadowbrook’s first residents of the 1880s. Today, most of the stories in that print resource, the display book at the community center, are now posted here on this blog. Meadowbrook history goes back to the 1890s when its early residents established a school in northeast Seattle. The Thornton Creek watershed which flows through Meadowbrook was named for John Thornton — who never lived there. In 2014-2015 I posted articles on this blog about the work which was done at the site of Meadowbrook Pond and along 35th Ave NE at NE 107th Street. There, Thornton Creek’s two branches converge at The Confluence. To learn more, choose the Meadowbrook topic on the Categories tab. And I love Fremont, too! Another one of my interests is in the Fremont neighborhood in Seattle. Fremont is a Seattle neighborhood located at the northwest corner of Lake Union, about four miles straight north of downtown Seattle. Fremont’s history and development is in great contrast to that of Wedgwood. The contrasts between the two neighborhoods have helped me in pondering why Wedgwood is the way it is. I have added my Fremont history writings to this blog and they can be found under “Fremont” on the Categories tab. Here is more about my expansion of articles on this blog, into other areas of Seattle neighborhood history. The business districts of northeast Seattle are mostly aligned along the north-south geographical ridge of the arterial 35th Ave NE. East of the arterial, the land slopes sharply away, down to Sand Point Way NE which follows the shoreline of Lake Washington. 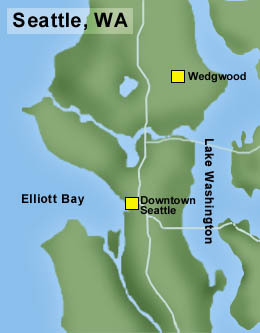 The Wedgwood neighborhood is in northeast Seattle. Map courtesy of HistoryLink. The boundaries of Wedgwood are from NE 75th to 95th Streets, 25th to 45th Avenues NE and west to Lake City Way between NE 85th to 95th Streets. “Boundaries” is a bit arbitrary, but in the 1950s the first Wedgwood Community Club set these streets as defining the neighborhood. Ironically Wedgwood Rock at 7200 28th Ave NE is technically outside of the boundaries of the Wedgwood neighborhood because the Rock is located south of NE 75th Street. It got its name from the plat of Wedgwood Rock, when developer Albert Balch began to build houses around the Rock in 1945. Beginning in the 1980s Seattle’s Department of Neighborhoods reinforced a sense of ownership and investment in neighborhoods, for newly re-engaged community councils. I knew the founders of the Wedgwood Community Council, Frank and Dorothy Brancato, and I have written about how they re-started activism in Wedgwood. The Gathering Place at the Hunter Tree Farm site, 7744 35th Ave NE. Wedgwood’s most unique space, The Gathering Place at Hunter Tree Farm, was created in 2011, a public-private partnership for a usable outdoor meeting area. The site of The Gathering Place at 7744 35th Ave NE, next-door to the post office, is owned by Hunter Farms and is used for their annual Christmas tree sales. During the rest of the year the site provides open space in the neighborhood and a place for other activities such as summer fruit stands. The Gathering Place initiative was coordinated by the nonprofit Pomegranate Foundation, and was created with permission of the Hunter family, a great example of cooperation for the benefit of the Wedgwood neighborhood. The plan for use of the Gathering Place was developed by neighborhood activists. It included emphasis on sustainability and a practice site for emergency preparedness. As time goes on we are seeing tear-downs and redevelopment both in the residential housing in Wedgwood and in its commercial district. 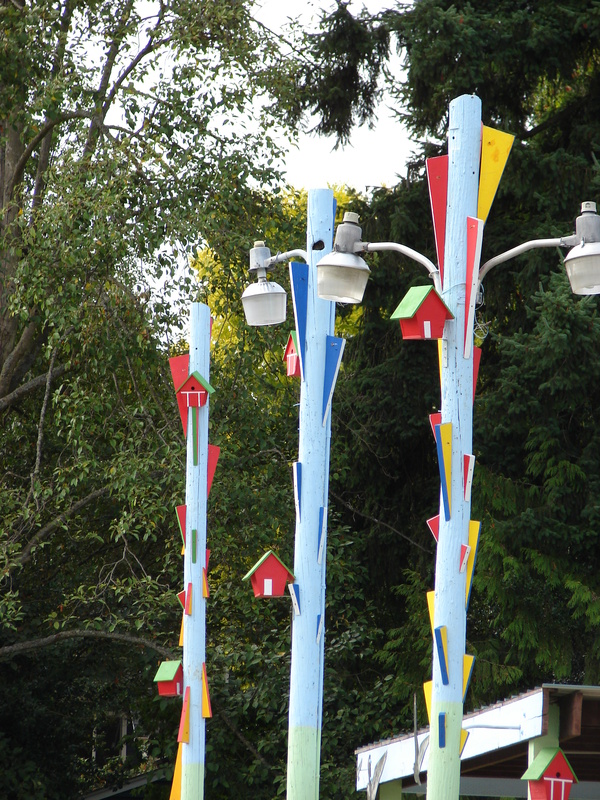 In 2011-2014 a consortium of Wedgwood activists did a grant-funded project to create a zoning plan which would help control the type of rebuilding in Wedgwood’s commercial district along 35th Ave NE. The plan anticipated possible tear-down of aging commercial buildings, and sought to control, via zoning regulations, what could be built in the place of present buildings. What is wanted by Wedgwoodians is retail storefronts with apartments or condos above the storefronts, to enliven the business district. Despite presentation of the Future of 35th Plan to City Council in February 2015, they have never acted upon the plan and its zoning requests. As a result, monstrous, out-of-scale townhouses are going up along 35th Ave NE instead of the stores, coffee shops and restaurants wanted by Wedgwoodians. I continue to monitor the issue of tear-downs and redevelopment, and write about it. I love your blog! So much fascinating Seattle history. I am having fun with history, and I am glad to hear you are enjoying it too.